Sometimes the worst part of a storm isn't surviving the winds and rain, but cleaning up after the event. Fallen trees and missing roof shingles often greet homeowners already dealing with power outages, post-storm flooding, and the chaos of emergency conditions. Repairing your home is important after a storm, but so is safety. Never attempt any repairs or refurbishment when your home remains flooded or when the power grid is flickering on and off in your neighborhood. With a heavy storm comes heavy rains, and inevitably flooding. If waters come into your home, be careful about getting it out. Turn off the power—but only if the water hasn't reached as high as any electrical outlets in the room where the main breaker lives. Otherwise, you could be wading into an electrified pond. Once the significant hazards no longer pose a danger to you or your family, you'll need to inspect your home for damage. Your contractor can help you perform a walk-through when the cleanup process begins to identify places that might need work. According to the experts at insurance company Allstate, there are many areas you'll need to look at when determining the amount of storm damage your home has sustained. Their advice regards homes that have sustained damage from a tornado, but the advice is easily applied to almost any post-storm aftermath. You can make these rounds with your contractor, and you'll also want to take pictures during the process. When you file a claim with your home insurance company getting funds for repairs will proceed much more quickly if you offer photographic evidence of the damage. Remember to look closely at your windows. A hairline crack might not be obvious from a casual inspection. 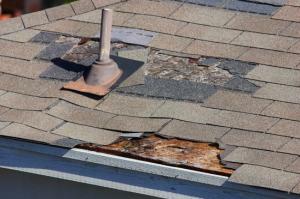 Are you dealing with the aftermath of storm damage or other weather-related issues on your home? Contact JH Exteriors for a Free Estimate for your home or call us at 1-636-642-1928.